Here are some more openings that a brother from another dept was kind enough to forward to Local 29. And again, isn't it strange that other cities and counties in Washington State are hiring so many firefighters, while our city (currently in the midst of a construction boom) is in such "financial trouble" that we still have 17 guys laid off? What gives? My name is Mike Westland, I am the treasurer and on the e-board for Local 3520 (East Pierce firefighters). We are in the fortunate position of adding 9 positons in the next 16 months or so, and our neighbors whom we work with closely should be hiring 3. The first 5 or 6 will be ff/paramedics. If you have any firefighter paramedics who are still laid off and are looking for a job have them call me. Our chief has said he is willing to take a close look at our laid of brothers and perhaps do a direct recruit/lateral hiring. It is my hope that we can do the same in the future for firefighters also, but for the time being it is just paramedics. Dan has a friend who is a mine superintendent for Hecla Mines. He is shorthanded for workers at the Lucky Friday Mine in Silver Valley. The fellow's name is Bearhunter. Just starting, the pay is $13 per hour. And there are worker's incentives too. Most guys are making an extra 1000 bucks a month. The job also has full medical benefits. If you are interested, call 208-744-1751 X303. Tell Bearhunter that you know Dan. Great article about FF movies and why they really don't work, written by a FF from the Bronx. 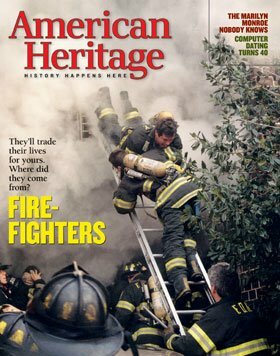 This is from the Nov/Dec Issue of American Heritage Magazine.